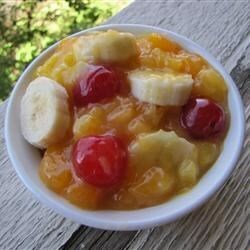 "This recipe came from my momma and is my favorite fruit salad. It can also be made sugar-free for those who need to watch their blood sugar. Delicious either way. Also very easy to double this recipe too! You can vary the flavor of this salad by using some of the juices from either the mandarin oranges or the maraschino cherries, or both, in place of some of the pineapple juice. Enjoy!" Drain all of the juice from the pineapple into a large bowl. Set the pineapple chunks aside. Add the vanilla pudding mix to the pineapple juice and mix well until smooth. Stir in the pineapple chunks, mandarin oranges, and maraschino cherries. Mix well. Refrigerate for at least 30 minutes. Just before serving slice the bananas into the bowl and fold in. This is a great recipe. I put fresh strawberries and fresh blueberries in. This recipe was a great hit for Father's Day. However it was a little to sweet. I will probably make it again though.